Chinese food producers who used potential tainted products from New Zealand dairy giant Fonterra have launched recalls on Sunday, further undermining Chinese consumers' confidence in milk powder products. New Zealand authorities have launched a global recall of up to 1,000 tons of dairy products across seven countries after dairy giant Fonterra announced tests had turned up a type of bacteria that could cause botulism. Clostridium botulinum is one of the world's strongest toxins and can destroy the human nervous system if ingested. In infants under 1 year old, it can trigger neural paralysis. Chinese consumers are extremely sensitive to the quality of dairy products, especially after a series of scandals of domestic milk producers, including the one in 2008 when at least six children died and about 300,000 were poisoned after being exposed to milk powder tainted with melamine, a toxic chemical. China's top quality watchdog has announced the names of Chinese producers that had imported allegedly tainted dairy products from Nea Zealand, including China's largest beverage producer Hangzhou Wahaha's Health Food Co and its Import and Export Co, as well as infant nutrition company Dumex, and State-owned food producer Shanghai Sugar Cigarette and Wine (Group) Co.
All four companies have initiated recallling measures, said the watchdog. Shanghai-based Dumex, which imported more than 208 metric tons of the tainted whey protein concentrate, said on Sunday that 12 batches of its baby formula products had been affected. "Dumex has started a preventive recall and has destroyed the affected finished products," read a statement on Dumex's website. Shanghai Sugar Cigarette and Wine (Group) Co said after investigations that the 4.8 tons of products from the New Zealand supplier had been passed on to its client, Coca-Cola Shanghai. In an online statement, Coca-Cola Greater China said 25 kilograms of the raw materials were used to produce drinks that blend fruits with milk under the portfolio of Minute Maid, and the rest have been isolated. "Due to the ultra-high temperature sterilization in the process of production, domestic and foreign experts and our researchers agree the batches of beverage products are safe," the statement said. "We are working on tracing the production and shipping records of the affected products and recalling them." Coca-Cola could not be reached on Sunday to find out the number of affected batches. Hangzhou Wahaha's Health Food Co and Import and Export Co, which imported nearly 15 tons of tainted whey protein concentrate, said the materials were used to produce Nutri-Express fermented whey drink, which left the factory by February and had almost been sold out. "We're asking sales staff to check with retailers whether products of this batch are still in the market and we will recall them immediately," the company said on its website. It did not reveal the batch numbers. However, Wahaha said tests did not find the toxin in the end products, as the bacteria cannot survive high-acid environments during production, and it has commissioned authoritative institutions to conduct tests for the toxin on its retention samples. China Food and Drug Administration said it has met managers at Wahaha, Coca-Cola and Dumex, requiring them to take measures to cope with the aftermath. Carrefour Shanghai said it has not received a notice from suppliers to recall or take products off shelves. "We'll talk over with our procurement department on Monday whether to withdraw the products," said a spokesman for Carrefour in Shanghai who gave only his surname, Ji. 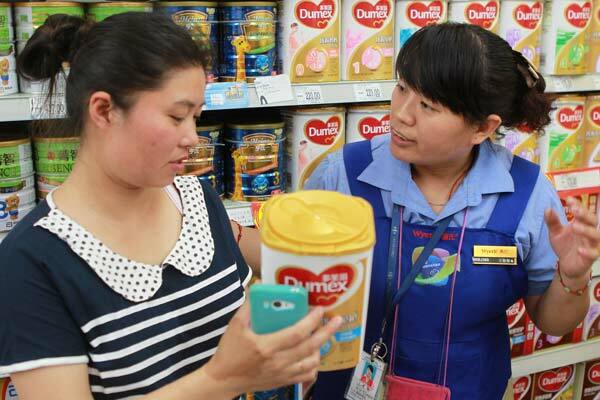 Dumex's baby formula and Wahaha beverages were on the shelves in two supermarkets - WuMart and Ito Yokado - in Beijing's Chaoyang district on Sunday. Forty tons of contaminated whey protein concentrate was found on July 31 in three batches Fonterra produced in May last year. The raw materials were sold to eight businesses in China, Australia, Malaysia, Vietnam, Thailand and Saudi Arabia for use in a range of products, and the end products were estimated at 900 tons. Fonterra declined to reveal the names of the eight businesses due to commercial sensitivity. A polluted pipe at its Hautapu plant in Waikato was responsible for the contamination, managing director Gary Romano said. No report of diseases caused by these batches of products has been received, according a statement Fonterra sent to China Daily. China has halted the import of all milk powder from the country, Reuters reported on Sunday, citing New Zealand's trade minister. In addition, Australian baby formula maker Nutricia said it is recalling three batches of its Karicare infant formula from the New Zealand market. The product is also popular in China. China's quarantine authorities said the three batches of products have not been imported to China through normal trade channels, but warned individuals to check the batch numbers if they have brought any such Karicare infant formula from New Zealand or bought such products through unauthorized channels online. A search of "Karicare" on Taobao, China's leading e-commerce platform, on Sunday generated nearly 50,000 entries. China has stopped the imports of all New Zealand milk powder. "The authorities in China, in my opinion absolutely appropriately, have stopped all imports of New Zealand milk powders from Australia and New Zealand," Trade Minister Tim Groser said on a TVNZ program. Over 83 percent of Chinese imported milk powder are from New Zealand in the first half of this year, according to data provided by the General Administration of Customs. Industry insiders think the milk powder contamination in New Zealand could lead to surging dairy imports from European countries.